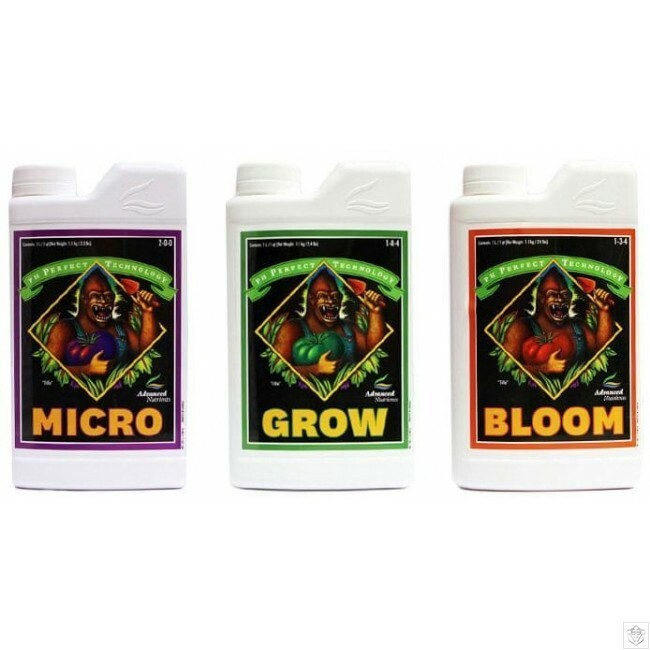 Advanced Nutrients Micro, Grow and Bloom can be combined to provide specialized nutrients for plants in structural, foliar and blooming stages. Formulas can be custom mixed for specific applications by combining the 3 components to suit the needs of your plants' particular growth phase. Remember! ALWAYS add Micro to your reservoir first, then Bloom and Grow. R.K. is a grand master grower of high profit plants from Santa Rosa, California. For over 15 years he used the same 3-Part General Hydroponics Fertilizer in his 20-light grow room. ... My yields were not all that large and sometimes I noticed that the same mix amounts of this general hydroponics stuff would create a way different pH or PPM. Once or twice I saw that I was losing an entire crop, but it was hard for me to figure out that it was the general hydroponics fertilizer, not contaminates or other problems. It was hard to admit I needed to change what I was using in my hydroponics system"
But luckily, R.K. heard about a brand-new 3-Part formula … and … he had a lot of clones he could afford to try a new fertilizer on. Although he was skeptical, he decided to test this new scientist-developed formula against the fertilizer he had been using for over fifteen long years in a straight up, head-to-head, growing test. "... Right off the bat, it was easy to see that my clones grew faster, they were greener and stronger, and they were ready for flowering about two weeks earlier. "My bloom cycle was more productive... I used less fertilizer overall... and got better growth and yield. I guess I learned to keep an open mind and to always look for the best way to do something, not just the way you're used to. 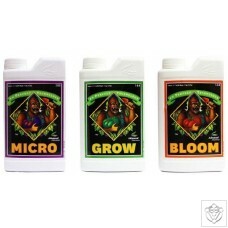 Now, pH Perfect® GROW, MICRO, BLOOM (GMB) is the solid foundation for my 20-light garden!" While a premium 2-Part formula like our pH Perfect CONNOISSEUR is actually the most effective way to precisely dial in a the exact nutrients and ratios your plants need... many growers enjoy the simplicity of an easy-mixing 3-Part formula... and they still want the most effective formula possible. Big Problem #1: Most 3-Part formulas are NOT made for the types of plants we grow. If you look at their ingredients or visit their manufacturing facilities, you'll discover they're about the same as the little $3.50 bottles of granulated fertilizers the average homeowner uses on their garden flowers. They're made in generic ways with generic ingredients. Big Problem #2: Is directly related to the fact other 3-Part formulas are not made for high-value plants like ours... and that is... they're hard to mix and monitor and are the direct cause of many of your plant growing problems. Many include artificial dyes of an unknown amount and molecular structure which could harm your plants (instead of harmless, organic dyes)... they don't have the right PPM or pH... they burn roots... they don't feed plants the right nutrients leading to slow growth and reduced harvests... and they may contribute to other growing problems. The bottom line? They basically wreck crops and waste your garden's potential! + I COULDN'T GET OTHER 3-PARTS TO MIX RIGHT AND THE PH WAS ALWAYS WRONG! "I used to use the cheapest fertilizers I could get. I had no good hydroponic information and didn't know where to get good hydroponic supplies. People told me it doesn't matter what I use for fertilizer. Everything is in the plant genetics. But when I started to know some other gardeners and saw that their plants looked way greener than mine and they were getting better harvests, I had to get better fertilizer. They told me that if I used better fertilizer I could get bigger buds. At first I used General Hydroponics 3-Part. But I couldn't get it to mix right so every time I used it I had to be real careful with the strength and the acidity (pH was wrong). I finally switched to your 3-Part and have had zero problems, and also am getting wicked yields. Thanks!" Big Problem #3: If you're using other, different formulas... even if... you do manage to get a formula with nutrients which are good for your plants (which, as you've seen, most don't have)... then... you're probably still wasting most of those nutrients because those formulas don't have carrier molecules to drive those nutrients straight into your plants faster and more efficiently. This is actually a big problem because most of your nutrients are not getting into your plants which wastes your money... and... this causes longer crop cycles which wastes your time. HOW YOU CAN GET AT LEAST 31% MORE NUTRIENTS INTO YOUR PLANTS AT LEAST 37% FASTER! One of the most important ways pH Perfect GMB gives you faster growth and bigger yields is through the special ingredients it contains that drive more of the nutrients in the formula into your plant faster than ever before. These nutrient delivery compounds are called "chelates" which are compounds that bind with nutrients and help them get inside plants so the plant cells can use them more quickly and more efficiently. It's these chelates which give pH Perfect GMB an almost "unfair" advantage over every other 3-Part formula on the market because it drives the nutrients into your plants in the most efficient, fastest manner possible. In fact, these exclusive chelates are so effective that tests (with our types of plants) show they deliver at least 31% more nutrients into your plants at least 37% faster! Consider this also: your plants will make better use of the formula you give them which means you'll save money on fertilizers, equipment and electricity because you'll have a faster, more productive crop cycle. Grand Master Growers everywhere understand it's especially important when you're using non-soil hydroponic systems including rockwool, aeroponics, NFT and other types of materials in indoor gardens to make the most out of every ounce of nutrients you feed your plants. CHELATION IS USELESS UNLESS IT HELPS DELIVER ONLY THE MOST HIGH-QUALITY, BUD-POTENTIATING NUTRIENTS INTO YOUR PLANTS! While chelation is extremely important because it helps your plants get more total nutrients and faster... you have to make absolutely sure... you're feeding your plants the correct nutrients in the first place! That's why pH Perfect GMB contains only the most proven, most potent and most effective nutrients in the correct ratios you need to get maximum growth and yield from your plants in every stage of your crop cycle. During the growth phase: when your plants need nitrogen, calcium and other necessary nutrients, pH Perfect GMB's chelates force these nutrients directly and immediately into your plants roots, leaves, cells and flowers-greatly speeding the growth phase. During the bloom phase: pH Perfect GMB feeds powerful chelated potassium, phosphorus and other nutrients that boost flower size and weight directly into the heart of your plants so they get the maximum size, weight and budding possible. WHAT GRAND MASTER GROWERS DO DIFFERENTLY TO GET HUGE YIELDS AND IMPRESSIVE HARVESTS FROM THEIR CROPS! As we've seen, if you want to dial in the exact nutrients and ratios your plants need, it's best to use a premium 2-Part formula-like our exclusive pH Perfect CONNOISSEUR blend. But, one big benefit of pH Perfect GMB is... even though it's a 3-Part formula... you can now customize it more fully than any other 3-Part blend to work better with your plants. While many hobbyists and growers with small gardens will choose to stick to the standard, extremely easy-to-mix and use 1-1-1 ratio … you also have the option to customize this 3-Part formula for the specific strain you're growing. Here's how: a band of scientists, mathematicians, and computer experts spent years developing and testing a nutrient calculator (available on Advanced Nutrients' website) that helps you create the optimum growing blend so you can make adjustments to get the absolute best growth and production from your plants. The formula is studied, buffered and constantly upgraded based on dozens of international research projects conducted in hydroponics, aeroponics, indoor gardens, and commercial agriculture projects across the world... so that you get... the absolute best 3-Part formula for whatever strain of plant you want to maximize. + I CAN MIX IT THE FAST WAY... OR I CAN MAKE A SPECIAL BREW! "I was using another 3-Part. It wasn't giving good results. I wanted to make a specific brew. I liked it that you have a nutrient calculator on your website so I switched over to use your 3-Part and it was a lot more reliable. I can mix the fast way or I can make a special brew based on your calculator. I got a quicker growth period and a larger size in harvest. Yours is better." The bottom line? You can get as in depth and involved with your plants as you want … or … you can simply stick to the basic 1-1-1 ratio of mixing and never have to worry about pH, PPM, or any of the other problems associated with other 3-Part formulas! PLUS, YOU WILL NEVER HAVE TO WORRY ABOUT YOUR PH AGAIN! In short, as long as your water falls between 4.5 and 8.5 pH (which is pretty much everyone's water)-this technology adjusts your pH for you and keeps it buffered there throughout your plants' growth and bloom phases! Which means you'll never have to manually adjust your pH... you'll never have to worry that your plants aren't in the premium growing environment... all you have to do is use pH Perfect GMB as directed and the "pH Perfect" technology takes care of all that for you! WHAT YOU CAN EXPECT WHEN YOU PUT THIS GRAND MASTER GROWING SECRET TO WORK IN YOUR GROW ROOM! You'll own a plush, productive garden where clones, seedlings or transplants grow way faster than ever before... they're bushier... they're bigger... and they're way more aromatic and potent. Even better is, you're spending less time fussing with your nutrients, PPM and pH because the formula is better balanced and mixes easy. ... In fact, you might just make all your friends jealous and have them begging you to know how you got such big buds... such delicious smelling plants... and such potency!